A fighter jet crashed in southern Russia on Sunday, killing the pilot, the head of the air force told Russian news agencies, blaming a technical fault. “An accident took place and the pilot died,” General Viktor Bondarev said, quoted by the Interfax news agency. “We are working out what happened. According to initial data, the reason for the accident was a failure of aviation equipment,” he said. The widely used Soviet-designed aircraft has experienced a string of accidents over the years in Russia and abroad. “The MiG-29 jet crashed while carrying out a planned test flight in the Astrakhan region,” said defence ministry spokesman Igor Konashenkov, quoted by the Interfax news agency. “The flight supervisor gave the command to eject, but the pilot, trying to save the plane, did not leave the controls and died,” Konashenkov said. A Russian airforce MiG-29 last crashed in 2012 in eastern Siberia when it flew into a hillside, Interfax reported. A year earlier, two pilots were killed on a test flight in the Astrakhan region. The MiG-29 was first produced in 1980s and has been exported to much of the world. It is deployed by the air forces of a number of countries including Iran. The United States has lost more than 400 military drones in major crashes worldwide since 2001, The Washington Post said Friday in a report questioning the safety and reliability of the unmanned aircraft. Citing 50,000 pages of accident investigation reports, the Post said military drones have since the 9/11 attacks “malfunctioned in myriad ways,” including mechanical breakdowns, human error and foul weather. “Military drones have slammed into homes, farms, runways, highways, waterways and, in one case, an Air Force C-130 Hercules transport plane in midair,” it said. Of the 418 known crashes between September 11, 2001 and the end of 2013, the Post said it had identified 194 so-called Class A crashes that resulted in either the total loss of a drone or damages in excess of $2 million. The total figure is almost equal to the number of major crashes involving US Air Force fighter jets and attack planes during the same period — even though the drones flew far fewer missions and hours. Sixty-seven drone crashes occurred in Afghanistan, and 41 in Iraq, but 47 occurred within the United States during test and training flights, the Post said on its website. One army drone crashed near an elementary school playground in Pennsylvania in April, while a Reaper belonging to the air force disappeared into Lake Ontario in upstate New York in November. The hefty Predator — arguably the best-known American military drone — was involved in 102 Class A crashes, followed by the smaller Hunter and larger Reaper models with 26 and 22 losses respectively. The Post’s investigation comes as the Federal Aviation Administration drafts a set of regulations to govern an expected surge in the use of commercial drones in the coming years. The United States owns about 10,000 drones, from the one-pound (0.5-kilogram) Wasp drone that combat troops can deploy in a firefight to the huge Global Hawk high-altitude reconnaissance platform. A Eurofighter jet crashed while attempting to land at an air base in southwestern Spain on Monday, killing its pilot, the defense ministry said. “A Eurofighter crashed on landing at the start of the runway of the Moron base,” near Seville, a ministry spokeswoman told AFP. The sole pilot of the plane, 30-year-old air force captain Fernando Lluna Carrascosa, was killed in the accident, which happened at around 2 pm (1200 GMT), the defense ministry said in a statement. Carrascosa, who was married with a young daughter, had over 600 hours experience flying Eurofighter jets, the statement added. The cause of the accident is still unknown, the ministry said. The Moron air base, located about 35 miles (55 kilometres) southeast of Seville, is shared by Spain and the US Air Force, but only Spain operates the Eurofighter jet. The Eurofighter, a multi-purpose twin-engine fighter jet introduced in 2003, is built by a consortium made up of British defense group BAE, European aerospace group Airbus and Italian defense contractor Finmeccanica. It is designed as a highly agile multi-role aircraft, capable of ground attack as well as its primary air defense role. The Eurofighter consortium, Europe’s largest defense program, is in fierce competition with other fighter-jet makers such as Lockheed Martin, Boeing and Dassault Aviation. Last month the head of Airbus’ defense division, Bernhard Gerwert, said the consortium would stop making the Eurofighter jet in 2018 if it did not win new export contracts for the fighter jet. Talks were under way to sell Eurofighter jets outside of Europe, to Qatar, Saudi Arabia, Kuwait and Malaysia, he said. A Russian Proton rocket with an advanced satellite on board crashed outside of Kazakhstan’s territory after lift-off, RIA Novosti cited a source as saying. There are so far no reports of damage or casualties. The Proton-M rocket, carrying an advanced Express-AM4R satellite, was launched on schedule from Baikonur on Friday. The Express-AM4R would have been Russia’s most advanced and powerful satellite. The spacecraft weighed 5.8 metric tons and had 63 transponders providing X-band, C-band, S-band, L-band, Ku-band, and Ka-band capacity along with 10 antennas installed. An unmanned aircraft of the sort Israel uses for surveillance and missile strikes in Gaza crashed in the south of the territory early on Tuesday, sources on both sides said. The Al-Rai news agency, run by the territory’s Islamist rulers, Hamas, said the drone came down east of the southern city of Khan Yunis. Hamas’s armed wing, the Ezzedine al-Qassam Brigades, said its fighters had retrieved the drone. The incident was followed by an Israeli air strike, also east of Khan Yunis, which killed three Islamic Jihad fighters, the militant group said. It was unclear if the two incidents were related. The Pentagon is shifting its drone operations from a US base in Djibouti to a more remote airfield after local officials voiced concern about possible collisions with commercial aircraft, officials said Wednesday. “There was a concern over what would happen if a MQ-1 (Predator drone) obstructed a runway, and that it would have a significant impact on commercial air operations,” said the official, who spoke on condition of anonymity. After the attacks of September 11 2001, Camp Lemonnier — located next to the Djibouti international airport — took on crucial strategic importance for Washington as a site for stationing special operations forces and drones for assaults on Al-Qaeda militants in Yemen and Islamist Shabab forces in Somalia. But after five accidents involving MQ-1 Predators since January 2011, the government of Djibouti demanded the Americans halt the drone flights out of Camp Lemonnier, where about 3,000 US troops are deployed, said the defense official, confirming a report in the Washington Post. Under an agreement with Djibouti, the US military will move its drone fleet from Camp Lemonnier to Chabelley airfield, about 10 kilometers southwest of the capital, according to a document from Congress authorizing defense spending for 2014. Lawmakers are “aware that the government of Djibouti mandated that operations of remotely piloted aircraft (RPA) cease from Camp Lemonnier, while allowing such operations to relocate to Chabelley Airfield, Djibouti,” it said. The decision to shift flights to Chabelley raised questions about Pentagon plans to spend $880 million to improve the infrastructure at Camp Lemonnier. The US government plans to invest $13 million for infrastructure at Chabelley airfield to support the drone flights, according to the document. But lawmakers wrote that they remained concerned about how operations at the new location would be sustained over the long-term and at what cost. The move from Camp Lemonnier to Chabelley has been under discussion for more than six months, the defense official said. “We have a really strong relationship with Djibouti… And this was a way to accommodate Djibouti in a mutually beneficial way,” the official said. Other US military aircraft, including cargo planes and fighter jets, would continue to fly out of Lemonnier, he said. The French military also uses the airfield at Lemonnier for about a dozen aircraft based there. A B-1B Lancer strategic bomber has crashed Monday (August 19, 2013) in a remote area near Broadus, Montana, during a routine training flight. The bomber took off from Ellsworth Air Force Base in South Dakota. Col. Kevin Kennedy of the 28th Bomb Wing said the two pilots and two weapons system officers ejected from the aircraft before the bomber crashed. The Air Force officials will conduct a thorough investigation to determine the cause of the accident. The Boeing B-1B Lancer is a four-engine variable-sweep wing strategic bomber, which entered service with the US Air Force in 1986. It features reduced radar signature and a top speed of Mach 1.25. 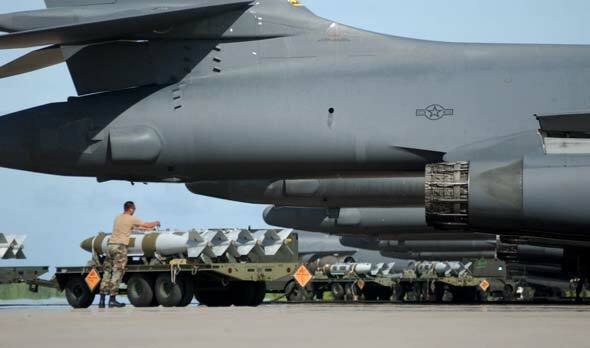 All B-1B bombers operated by the USAF are currently deployed with two units the 28th Bomb Wing at Ellsworth Air Force Base in South Dakota and the 7th Bomb Wing stationed in Dyess Air Force Base in Texas. The B-1B is expected to continue to serve into the 2030s, according to USAF officials.